Today I skived off proper work to sit on a series of uncomfortable chairs at the inaugural Content Marketing Show, which was organised by the chap behind Brighton SEO (which I also went to this year, but could not find the time to write-up), Kelvin Newman from Site Visibility. 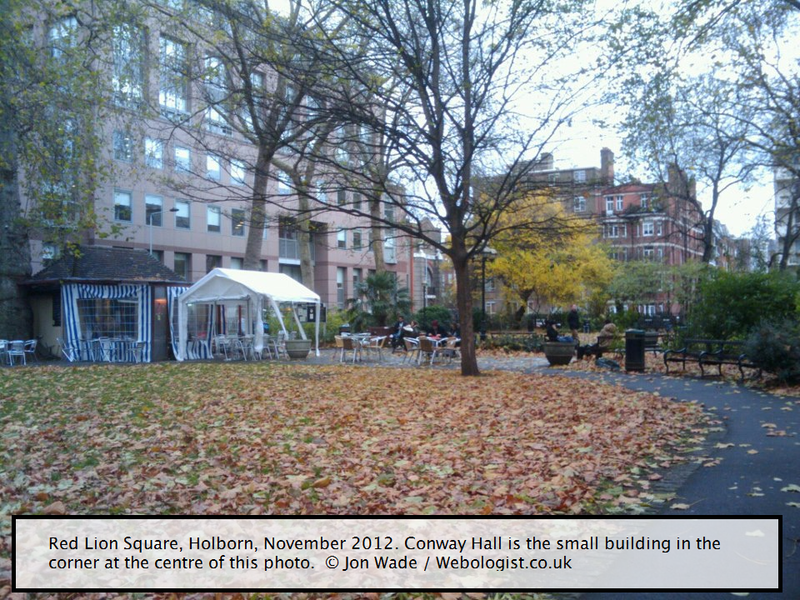 The event was held at Conway Hall on Red Lion Square, near Holborn. 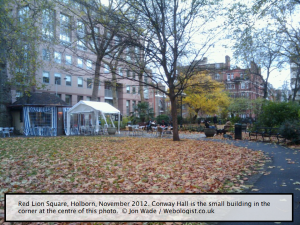 In the gardens at Red Lion Square there is a statue of Fenner Brockway, British anti-war activist, and a bust of Bertrand Russell, the philosopher and anti-war activist. Conway Hall is home to the South Place Ethical Society and they organise regular talks and lectures on humanism, bioethics and related topics. They also do Sunday concerts there, and it was a nice hall, if you sit on the chairs in the stalls, and not the ones on the balcony! I started upstairs on the balcony seats as I arrived late, but soon had a numb bottom. After the break I got a seat at the back on the ground floor, that was just a wooden bench. More numbness. After the first talk in the second interval, I moved to a proper chair, and managed to concentrate better for the rest of the day. See? This is why I do not write-up these web marketing / SEO things much, I ramble on about busts and bottoms. The show must go on! Now, there are no doubt some excellent summaries and also detailed reviews of this show already and many of the speakers have all the info on their blogs and some have put presentations up on Slide Share. So there is little point in me writing it all up (besides, it is already past my bedtime). So I will share my notes. When I attend these events, I try to only write down actionable ideas and avoid scribbling out everything that is said. That being said, I did write some rubbish today, so I will edit it down. Let’s go! Oh, I missed most of the first speaker, Philip Sheldrake, so will skip that. But you can read what he had to say on Koozai’s blog post about the show: Morning Session Write-up of the #Contentmarketingshow. Content has a lifespan – if no longer needed, kill it. Lauren very briefly mentioned Persona Development. In fact, this came up a few times, and it is still something I have not delved into. So I will. This link is as much for my benefit as yours, I have not read it yet, just linking to review later …. www.usability.gov/methods/analyze_current/personas.html – first result in Google on the topic, so I assume that they know what they are talking about! Key message from Ian Humphreys @ianphumphreys (all speakers are really into Twitter, in fact, not a single Facebook, LinkedIn or Google+ profile was shared, but all had Twitter – I will link them all up, if I remember / have time). Generally, the central theme is around lifestyle, experiences – things that trigger an emotional response. This can be summed up as Community. You want your clients / customers to be engaged with your brand. Make your site social, use social media platforms, make it easy for people to share, to talk etc. The stream has a fast paced turnover …. Flow is your input in the stream, Stock are your products, pages etc. This all seems a bit vague now I am reviewing the notes. I think the key really is – be active on social, use it to network with others. The actual stuff you write matters less than the activity itself. Leave the proper content to you brand, website etc. Someone described the friendship network as being people you went to school with, and interest network as people you wished you went to school with. I see it more as Facebook and Twitter/Google+ …. Pinterest – (amazingly, the only mention today!) – the most popular word used on Pinterest is Love. The most repinned (repinned is not a real word, yet) words are chicken and recipe. There was an interesting point about this ….. oh. If you want your content shared on Pinterest, make sure it is a chicken recipe. Um, no, that can’t be it. The three ways content is shared online. Creation, like photos, blog posts, videos etc. Replication – Pinterest is the obvious example. Mutation – YouTube video montages etc. What Makes the Most Sharable Content? Tom talked a bit about this. SURPRISE! Studies found that a combination of Emotion and Surprise leads to the most shares, likes etc. The best emotion is happiness – people are more likely to share something which makes them happy than something which shocks. INTERVAL – OK, I have so many more pages of notes, more than I though. Will continue tomorrow. I also feel I have drifted from the objective of writing only the ACTIONABLE POINTS. Need to focus!